Conway Castle was begun in 1283 by Edward I and was completed by 1293. 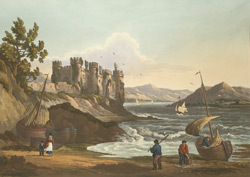 The castle was a stunning feat of engineering and design and is one of the most magnificent castles in Wales. It stands as a symbol of Edwards determination and power after his defeat of Llywelyn, Prince of Wales. It was designed by James of St. George the Master of the King’s Works in Wales who had designed many of Edward’s castles in Wales. The castle complex included a Great Hall, guardrooms, stables, kitchens, a chapel and in fact the castle is part of a complete town defensive system with 1,4000 yards of walls, three gateways and 22 towers.